The "Work" singer graced the red carpet in a three-dimensional flower explosion of a dress. Meticulously cut from jacquard florals the textured petal masterpiece boasts an asymmetric hemline, cut-outs, and impeccable craftsmanship. The "Tightrope" singer arrived looking like a futuristic ballerina in a striking gown with a lacy white bodice featuring feathery appliques that resemble little butterflies landing above the black ribbon around her waist. 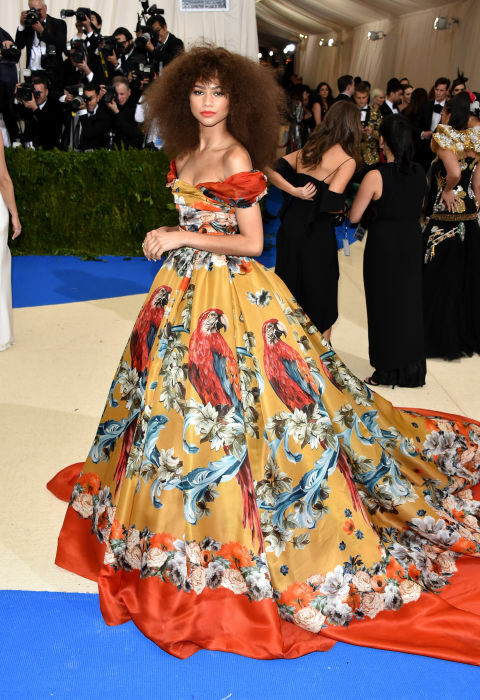 The "Shake It Up" star was a headturner in a ball gown covered in a tropical parrot print. Colored with saturated shades of tangerine and lemon yellow, her dress was one of the night’s most eye-catching. New trend: painted-on hair? Last spotted bald on set for her upcoming movie, "Life in a Year," the actress somehow managed to return to her silver-platinum roots without literally having any. Crystal dots top Delevingne's silver-painted scalp, completing the out-of-this-world aesthetic. Decked out in Tiffany jewelry "The Blind Side" actress stood out from the crowd in her princess skirt replete gown with a black corseted top. She finished the look with a dark blunt cut + black lipstick combo which helped her from looking too saccharine.